For the past several weeks, you may have noticed more Emory employees taking the stairs, more people wearing their sneakers, and an increase of walkers in the parking decks. That's because Emory employees are moving more, thanks to the Move More Challenge. The eight-week challenge, which began Sept. 21, is Emory's first enterprise-wide challenge designed to encourage employees to add more movement to their daily routine. Using a Fitbit device, participants track their daily steps and active minutes, setting goals, having fun, and competing with their co-workers. Myca Harrison, an Emory Healthcare employee who works at The Emory Clinic-Decatur Plaza, says she loves her Fitbit. "Fitbit has been the best tool ever, and I'm so grateful to Emory for implementing this tool as an option for employees to make healthy changes," she says. Dawn McMillian, Emory wellness specialist, notes the strong participation across the university. "We are now in week six of the challenge and, so far, Move More participants have walked an average of almost 9,400 steps per day – that's about 650,000 miles," she says. Over 6,000 challenge participants from both Emory University and Emory Healthcare make up 40 different teams that are competing for prizes and bragging rights. So who's winning the challenge so far? Currently, Internal Audit is leading the small team category (0-49 people) with an average of 11,449 daily steps; Campus Services is the leading team in the medium category (50-125 people) with 10,298 steps; and Yerkes is currently ahead in the large team category (126+ people) with 10,126 steps. At the end of the challenge, a trophy will be awarded to the teams in each category that have the highest average steps for the entire eight-week challenge period. Individual challenge participants who meet certain thresholds are also entered into a drawing to receive prizes at the end of weeks 4 and 8. Week 4 winners were announced last week. Park your car farther away from the door. Take two short breaks during the day and walk for 15 minutes each. Take a 30 minute walk around your neighborhood. 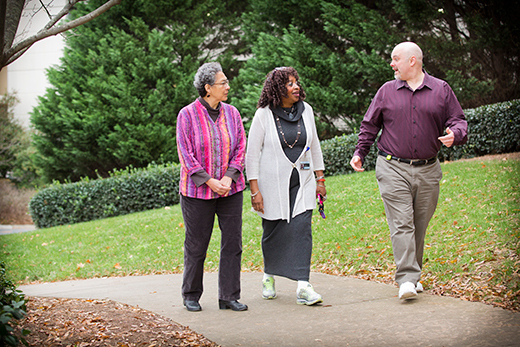 Join an Emory walking group. Walk to meetings rather than driving. Carry groceries in one or two bags at a time to create more steps. The Move More Challenge continues through Nov. 15, and there are many group walking activities planned for the remaining weeks. Participants are encouraged to share their pictures on social media at #MoveMoreEmory. "Our hope is that, even after the challenge is over, employees will continue to use their Fitbit devices, set goals, keep walking, and track their progress," McMillian says. "There are so many health benefits we receive from moving more every day."